"Dream's engineering sets their lightweight mirrors apart from competitors. Your engineering goes beyond the lightweight aspect. You focus on actual performance!" 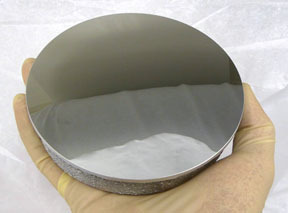 Dream's engineered lightweight mirror finished to quality level ~3x higher than Hubble's M2. 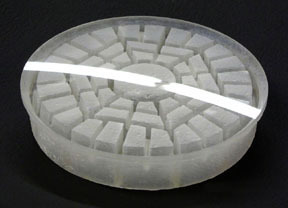 Convex hyperboloidal M2 for 24" Dream R-C (Ritchey-Chrétien) telescope. Carbon fiber telescope designed & produced in-house by Dream Telescopes. 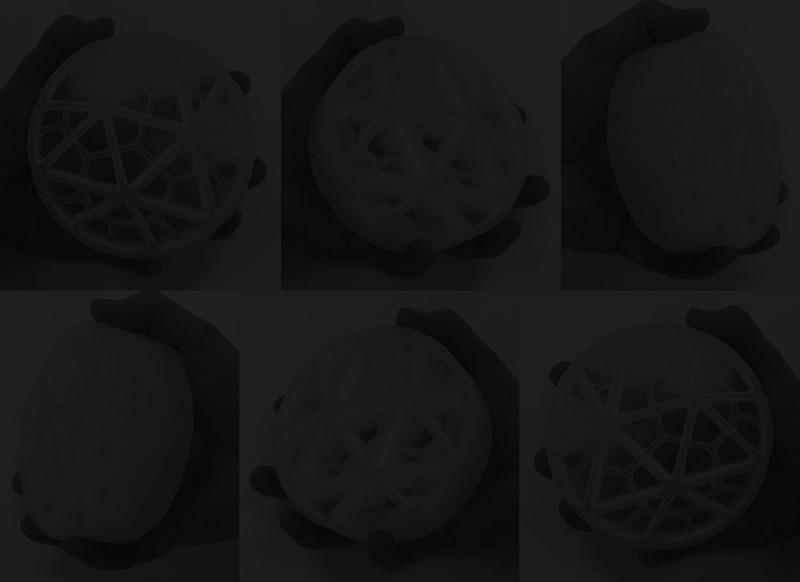 * Convex Dream mirror tested with QED SSIa, using the 2nd most powerful interferometer on the market. * Conservative L/20 P-V surface (632.8nm) with L/125 RMS surface. The maximum P-V error across this mirror is less than 20 nanometers. The RMS is around 5 nanometers. * The finished Dream mirror was independently tested three separate times, over five days. 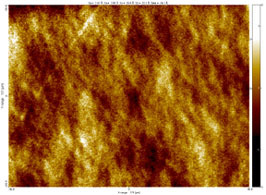 The quality never dropped to less than L/125 RMS surface (0.008), showing the same figure stabilty as Zerodur, Sittal and other zero-expansion materials. * Better than 10/5 scratch/dig. * Desired radius: 629.4mm. Radius achieved: 629.385mm. Off by only 15 microns or 0.0024% (1/420th of 1%). 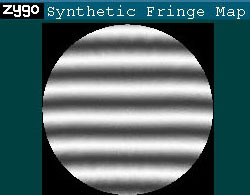 Fringe map of the surface is shown to the left. 2.02Å avg RMS Surface Roughness test is shown to the right. Click on the image to see an enlarged view with details. 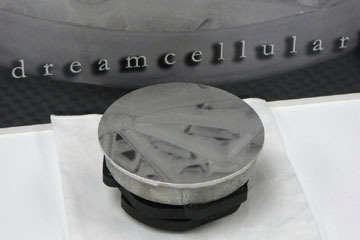 Finished & coated mirror shown in Dream's dedicated carbon fiber mirror mount. All advanced composite work is done in-house. This includes FEM/FEA, for both the engineered mirror and the carbon fiber. Dream's carbon fiber was engineered from day one to closely match the CTE of the Dream mirrors, making an athermal instrument. This mirror mount integrates into the moving portion of the spider hub of the telescope, to allow focus and/or M1 to M2 spacing. Dream can help you achieve the quality, low mass, high stiffness and ultimate performance you are after. From UV to LWIR. From ground to air to space. Contact Dream to discuss your project's requirements. Because Dream produces the engineered, lightweight mirrors in-house, this gives Dream control over as-designed versus as-cast variance, annealing, scheduling/delivery, and an ability to quickly modify a design from its archives. Dream's mirrors are designed using an iterative design/FEM process to reach the design goals for both polishing and gravity displacements. Dream's owner, Shane Santi, started researching lightweight mirrors of all types and materials more than 20 years ago. He has been designing lightweight mirrors using FEM/FEA since 2003. He has more design experience in optimizing lightweight glass mirrors than any other individual in the world, as well as designing, fabricating and using dedicated carbon fiber mirror mounts with these mirrors. This breadth and depth of knowledge, as well as empirical experience, gives Dream's customer and edge. Dream is at the forefront of lightweight mirror technology because it believes that there should be just as much engineering in the geometry of the mirror as the mirror mount. Shown above is the finished athermal 24" Dream R-C that utilizes Dream's mirrors (M1 & M2), with extensive use of carbon fiber and CF skinned sandwich core parts and assemblies. Copyright &COPY; 2003 - 2018 Dream, All Rights Reserved.